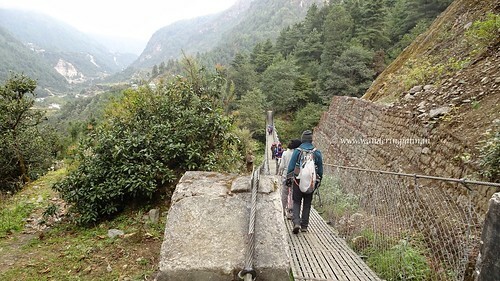 Very early on on my solo trek to Everest Base Camp had I started to learn that questions like such shouldn’t be asked to anyone returning from the trek, even if out of courtesy, because the answers weren’t promising. 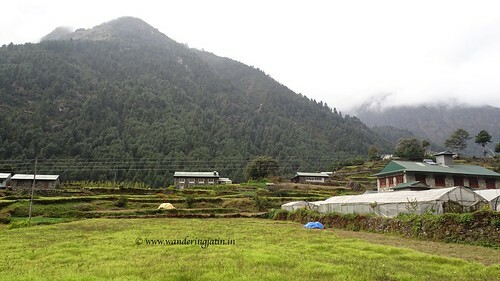 It was a relaxed start around 1.25pm when I began my trek from Lukla at 2,860m. I had had some Cheese fried rice and milk tea just before that. I asked some folks to take my picture at National Luminary Pasang Lhamu Memorial Gate at Lukla to mark the beginning point of my trek. I was wearing a very light half sleeves’ quick dry t-shirt and a poly-mix jacket which was more than enough to ward off the wind and provide the warmth from roughly 7 degrees at Lukla. A normal pant did the job for my legs. My backpack had weighed around 11 kilos (and had intimidated me when I had looked at others’ packs, removing my disillusion that I was carrying a lighter pack) when I had measured it at the Kathmandu airport. 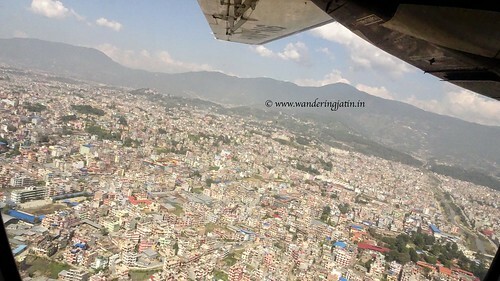 Oh, that reminds me… I must tell you about my flight to Lukla! 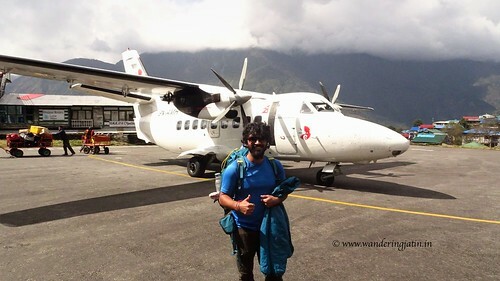 I had flown in to Lukla from Kathmandu in the small passenger aircraft which serves as a major transport medium to get in and out of the Solukhumbu region, for trekkers and locals alike. I had learned about the preferred side to sit in to get the better view, and be rest assured when I say that I had tried all the tricks but made sure I got my desired seat. That 27 minutes’ turbulent airtime had me up close and personal with those humongous mountains for the first time! I can never forget the sight of those snow tapped mountains rising high above the clouds! Apart from the regular mountainous stuff and the snaking rivers, a running double rainbow had my gaze engaged all the time. 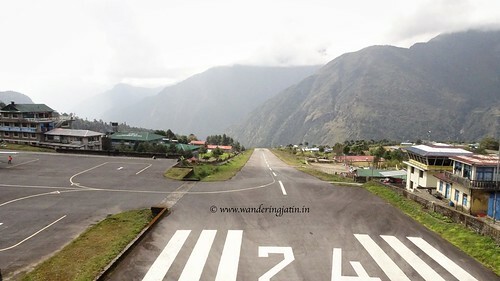 When we landed, the famed short runway of Lukla airport was clearly evident in the urgency of our braking – rough, quick and dramatic, but thankfully safe. 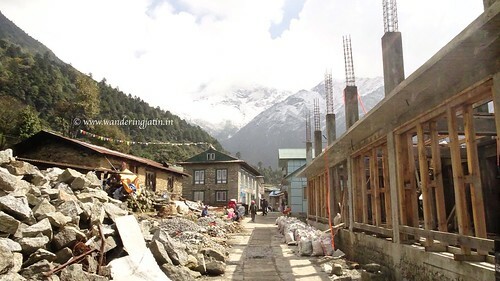 Lukla was stunning: from the short runway to the huge white mountain in the backdrop, the valley, the small market, everything was very scenic! 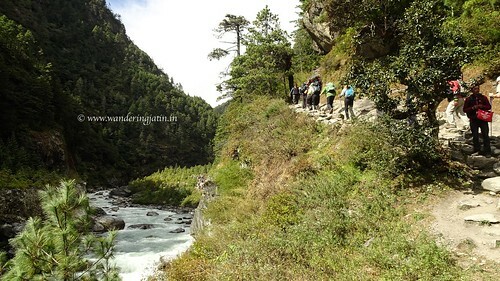 Exiting Lukla in the company of the tall and green trees, my legs were slowly developing their rhythm to the trail – well marked and mostly gradual. 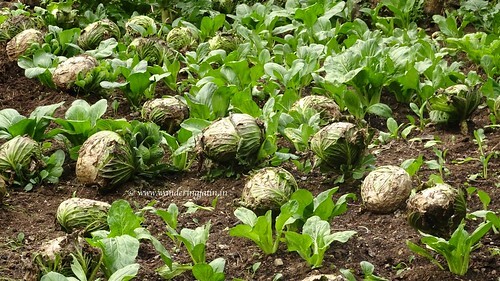 Occasionally, fields (mainly cabbages) would come by announcing the oncoming of villages, which visibly had converted well to cater to the vast number of tourists from round the world. The cafes with shiny exteriors, wooden interiors, many a glass windows and central heating stood out against the old houses which were mostly done in clay and mud. Many varieties of flowers in different colours were added ornaments to these villages. I could see the kids in school uniforms walking out of the “metro” villages to their remote ones which were nowhere in sight. I befriended many of these guys on the trail and gave away the candies I almost always carry; a good travel hack I might add. 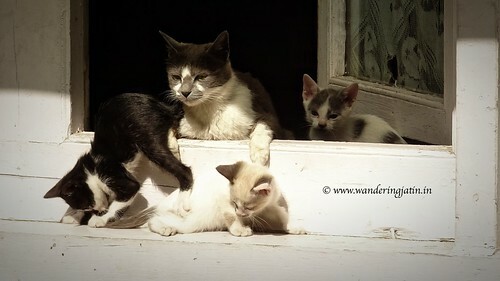 I had already made acquaintance with few of the fellow travellers. I ran into a father and son duo from Belgium a couple of times whom I had shared my flight with. A couple from Bangalore, Vishwas and Rita were also walking at almost the same pace as mine. The first long set of stairs going up came giving a slight hint of what’s to come. 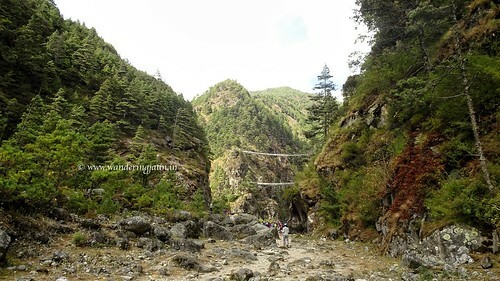 We walked the first of many long suspension bridges over the river to cross the valley. Phakding came. In 3.5 hours. Phakding is the usual rest stop for the day according to the “guide book”. But I hadn’t read any guide books and had planned to follow my instincts guided by the route map and locals. I still had energy to go farther and enough daylight to back me up. I recollected the blister Rita had started to develop in her foot and left some plasto-tape with a local at Phakding to give them as those guys still had some catching up to do. That’s when I met Ramesh. Ramesh, a porter/guide, was returning back to Namche after having successfully led a group and leaving them at Lukla. A brief exchange of words, and we became walking partners. He most definitely must have been guffawing inside at observing my pace compared to his, but he kept me company. Speaking in broken Hindi about Indian cities, songs and cinema, we were slowly cementing a strong friendship. He would smoke cigarettes quite frequently to which I would funnily ask him to maintain distance and he would laugh and oblige. Daylight was dying down very fast and I decided to not continue until the intended village Monjo. I: Which village is next? I: Are there lodges there? Ramesh: Yes, but what about Monjo? I: Let’s stay here for the night? 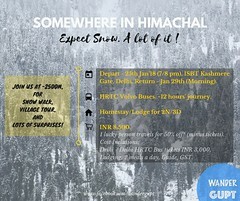 And continue our journey to Namche tomorrow? I: Come on, let’s stay here and start together tomorrow, let’s? Next scene was me playing card games with French trekkers sitting while Punjabi songs played from my phone in the host’s speaker system in the diner at the lodge we were staying in! What awesome time we spent and memories we made! Retired soon after, I pondered over the privilege I had of walking over the same path each Everest summiteer has walked on; and fell asleep. 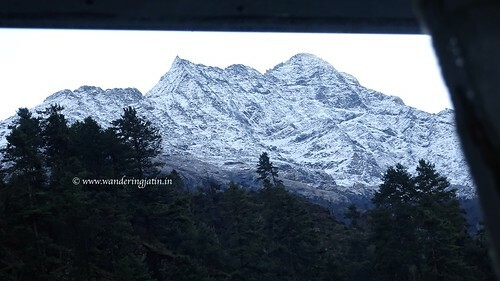 And woke up to snow-topped mountain rising high from my room’s window. Around 630am. Ramesh and I started together – walking, laughing, exchanging dry fruits and clicking pictures. 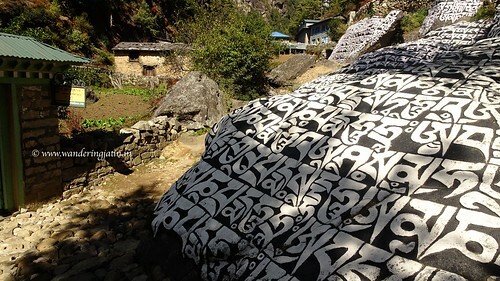 We walked through the farms, past the many Buddhist Mani walls, flag poles and prayer embedded rocks. 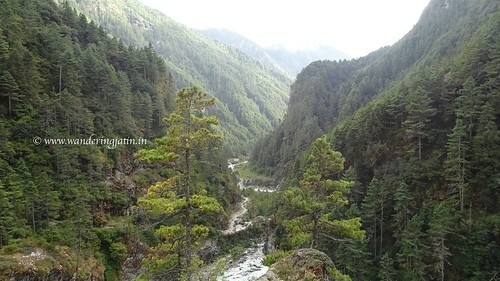 I saw a young beautiful female on the trail from the West, with an artificial leg trekking towards Namche. Just when this started to sink in me, her leg fell off! She sat down on a boulder on the trail trying to fix it up while laughing hysterically and speaking of the sweat which led to that. It was comforting to see that she was strongly supported by her family, but sure enough, this episode had my emotional state going with many points to ponder upon, apart from the goosebumps. 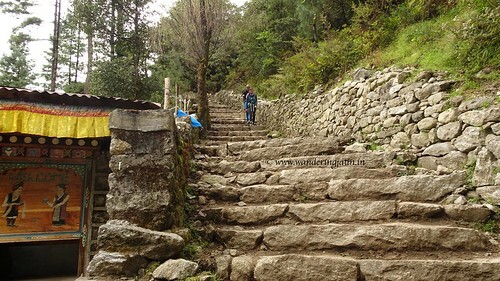 Almost an hour into the trek and just before Monjo, Ramesh suggested me to move on and went to meet his friend, promising to catch up later. I got my National Park ticket from Monjo and entered Sagarmatha region walking along with Sherpas humming Bollywood tunes. 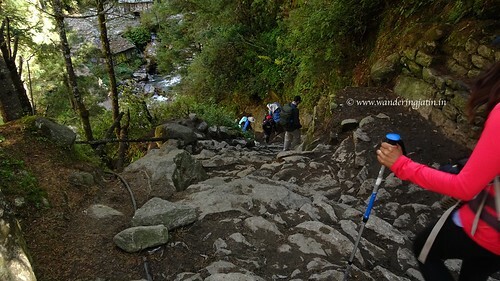 Post lunch, I started the steep ascend and Ramesh still hadn’t caught up. I met Vishwas and Rita again and walked with them for a while. We walked alongside the milky Green river flowing the opposite way for some time and it was quite scenic. The ascend that day seemed very tough and to this date, scares me. It was long and steep, and spirit breaking. Standing near the riverside, I could see the steep ascend ahead of us, and the Hillary Bridge (the higher one of the double suspension bridge, refer pic) in the sky. We had a lot of climbing up to do, in a short distance. Once up there though, the sight was phenomenal! 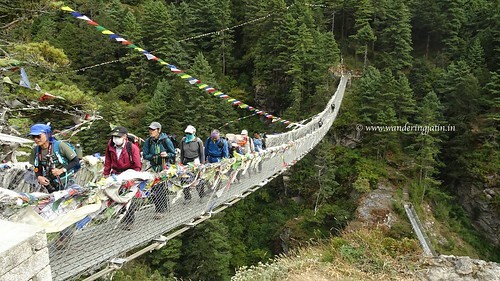 Strong winds blew, and the prayer flags tied to the bridge fluttered enough to be heard. I gathered the courage to walk the Hillary Bridge without looking down (I am scared of heights! ), but being reminded of Resonance principle by Vishwas who was walking behind me didn’t help! I made it to the other end somehow. Ascends continued. I was all alone on the last stretch towards Namche. Tired, I was sitting, just when the familiar face of Ramesh showed up through the flying dust and between the yaks carrying the gas cylinders up! I became happy. We reported at the check post before Namche, sorted out the permits and moved on. 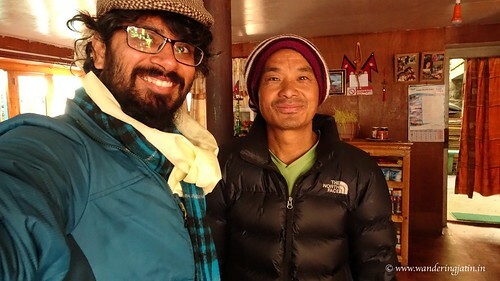 Ramesh had invited me earlier to stay at his house, and by his house he meant the place where he stays with other porters in a lodge which I figured out later! 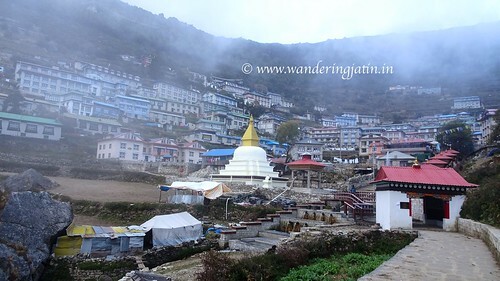 The scenic and busy mountain town Namche worked its charms on me from the very point of arrival. The beauty of sharing my bed with 10 other porters and the beauty of stunning Namche Bazaar I will share in my next post!